Emiliana Disilvestro studies international business at Saint Louis University at its Madrid campus. David Howden is Chair of the Department of Business and Economics and professor of economics at St. Louis University’s Madrid Campus, and Academic Vice President of the Ludwig von Mises Institute of Canada. No two countries’ responses have polarized commentators over the past five years more than the contrasting post-crisis policies in Iceland and Ireland. 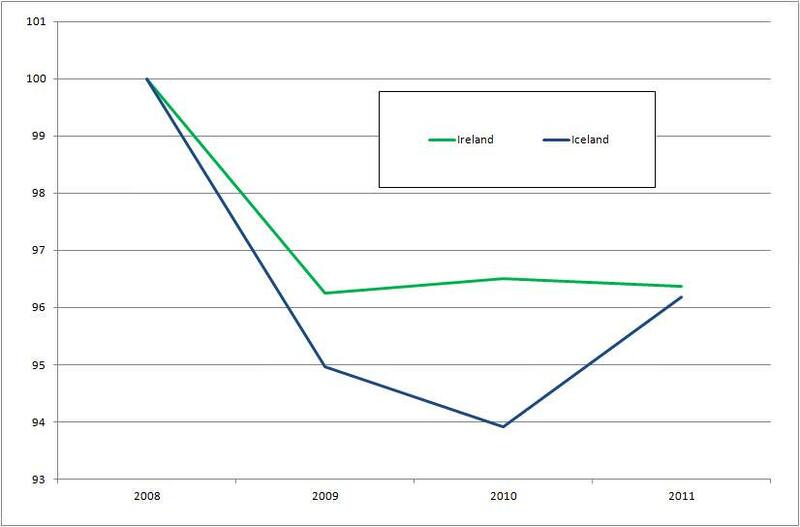 In a paper published in Economic Affairs (available here as a PDF) I contrast the policies enacted by Iceland and Ireland, perhaps the two countries most affected by the liquidity freeze of 2008. A common conclusion has been that one country did everything right and the other did everything wrong, however, I take a more pragmatic approach. 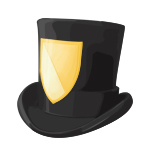 There are some positive aspects in each case, and other aspects we can do without. Iceland allowed substantial swaths of its financial sector to collapse (mostly foreign-domiciled subsidiaries) while Ireland enacted blanket guarantees to keep its financial sector afloat. Iceland quickly inflated its krona in a bid to regain international competitiveness through depreciation. By being locked in the euro, Ireland was unable to pursue a similar path and instead had to become more attractive to foreigners by lowering its domestic prices (i.e., disinflation or outright deflation). Iceland stymied a capital flight by enacting monetary controls aimed at keeping investment within the country. By being part of the European Union, Ireland maintained its commitment to free capital markets, and investors were able to enter or exit as they pleased. The evidence is mixed as to which solution was more effective. 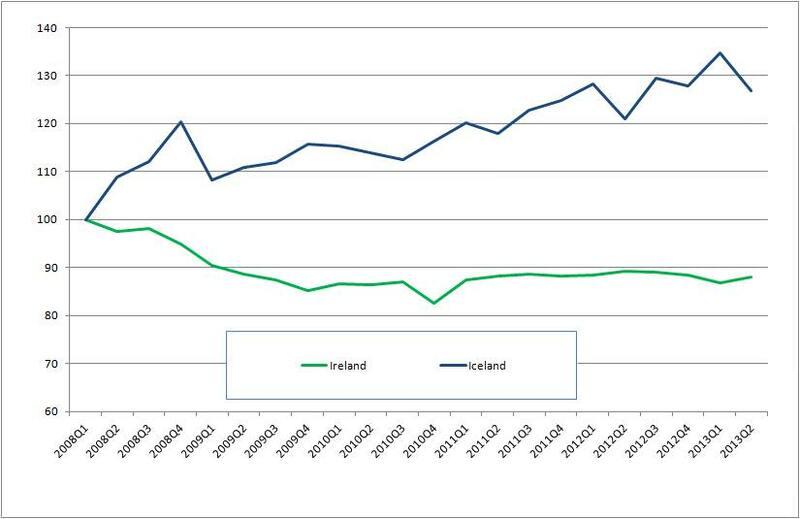 Iceland seems to have softened the immediate blow of its recession, but present growth in Ireland is stronger. In a similar way, unemployment in Iceland was less and still remains lower today. For our purposes here, I want to focus just on the effects of their respective monetary policies, and how the short-term gains from Iceland’s inflationary response now pale in comparison to Ireland’s more subdued response. Figure 1 shows the common story. Iceland’s inflationary policy stimulated exports, papered over some bad debts, and in general allowed it to exit the storm relatively unscathed. In contrast, Ireland is languishing in slow growth and five years later the country’s income is still 10 percent below its pre-bust peak. Such an analysis neglects the pernicious effects of inflation on the Icelandic economy. This policy increased the money supply by almost 20 percent in 2008 alone, and lead to an immediate increase in prices. In figure 2 we get a better feel for how the situation felt to the average Icelander or Irishman. As the Central Bank of Iceland inflated the money supply, price inflation raged. Icelanders continually felt their financial security worsen as their purchasing power collapsed. This was not apparent to the rest of the world, fixated as it was on the nominal prices the Icelandic economy posted. By its nadir in late 2010, inflation-adjusted income in Iceland was down over 35 percent. In Ireland this decline was muted because of price deflation. 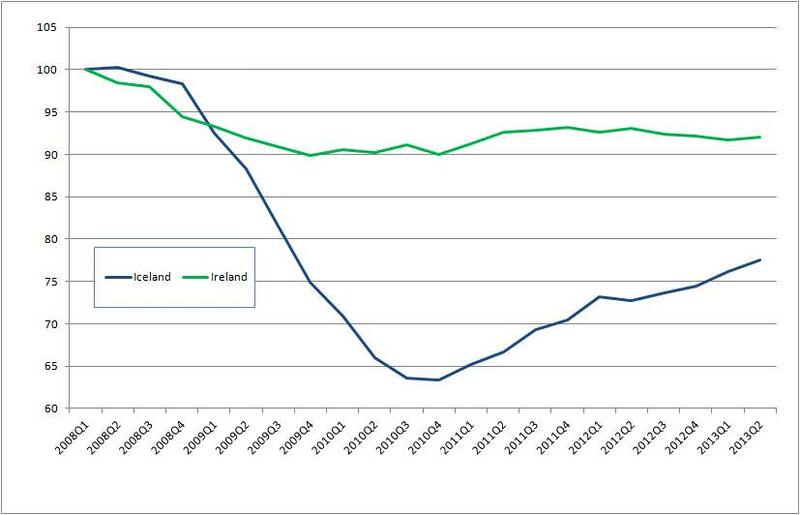 As domestic prices fell it became easier for Irish citizens to make their declining nominal incomes go further. At its worst, the Irish economy collapsed less than 10 percent in real terms. This seems to suggest that Ireland had the better solution by not pursuing an inflationary monetary policy. Some will note, however, that Iceland’s recovery since 2010 has been quite strong. Indeed, if we look at the drop in the employment rate for both countries most probably feel more sympathy for the masses of unemployed Irishmen. Digging deeper, however, we find that not all is as it seems. Many Icelanders work two jobs to make ends meet. This effect was increasingly pronounced through the recession as inflation made it more difficult to get by with one salary. As a consequence, many Icelanders lost one job during the recession but the unemployment statistics did not reflect this as they were still employed elsewhere. This is notably not the case in Ireland, where not only is one job per worker the norm, but falling prices made it easier for an employed person to make ends meet as the recession continued. A better way to gauge the employment situation is to look at changes in the hours worked. Here we can see the situation is reversed. 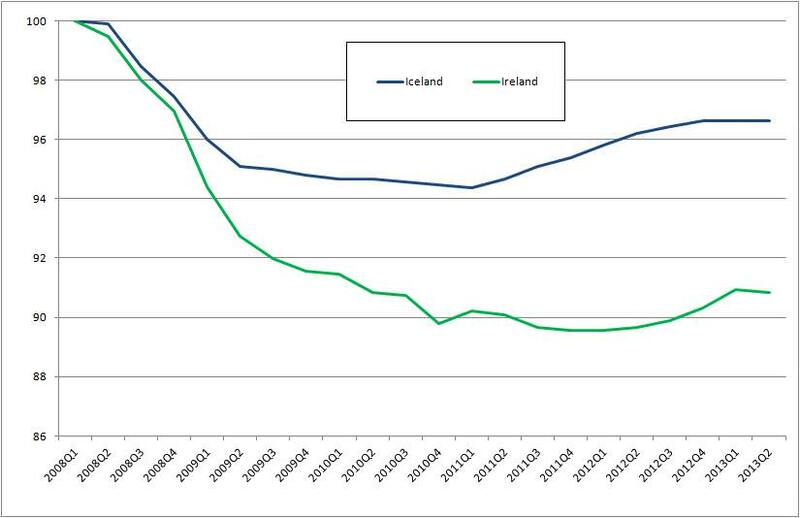 By the recession’s trough in 2010 the number of hours worked by the average Icelander had fallen 6 percent while in Ireland the corresponding drop was only 3.5 percent — almost half as much. Both countries still have problems. Iceland’s monetary controls are notably stifling needed investment, while Ireland is left with a large debt from bailing out its banks, and this is stalling growth. One thing is clear though — the effects of monetary policy are stark and the proclaimed benefits of Iceland’s inflationary policy were counteracted by the price inflation that ensued. Don’t let a good crisis go to waste; learn something from it. As the tale of these two countries demonstrates, inflating one’s currency may give the appearance of recovery, but the truth is somewhat less rosy.